If you wish to return an item, you must obtain a Return Merchandise Authorization (RMA) number. To obtain an RMA number and return instructions, please email support or contact Roos Instruments at 408.748.8589 (Monday - Friday 9AM - 7PM Pacific Time). An RMA must be requested within 15 calendar days of your invoice date (ship date for credit card orders).NO returns of any type will be accepted without an RMA number and ALL returns must be shipped prepaid and insured via any common carrier (i.e. UPS, FedEx). Tracking information is required. 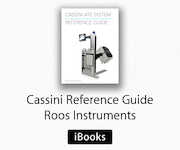 Roos Instruments reserves the right to refuse any return that does not include the following: 100% complete, in resellable condition (packaging has not been damaged or defaced), and with original packing material, manuals, cables, or other accessories provided with the item. Roos Instruments warrants its hardware products and replacement parts/modules against defects in materials and workmanship for one year. If RI receives notice of such defects during the warranty period, RI will, at its option, repair or replace the hardware products or replacement parts/modules which prove to be defective. Roos Instruments warrants its software products designated by RI for use with a hardware product, when properly installed, will not fail to execute their programming instructions due to materials and workmanship for 90 days. If RI receives notice of such defects during the warranty period, RI will, at its option, repair or replace the defective software media. RI does not warrant that operation of software or hardware will be uninterrupted or error free. Defective Products may be returned to Roos Instruments for repair or replacement, at Roos Instruments' discretion, within 15 calendar days from the invoice date. Opened and/or Unopened Non-Defective Returns being returned for credit or replacement are subject to a 20% restocking fee and must be completed within 15 days from the invoice date. Support and Services are NOT refundable. Inoperable Items (DOA) - All Roos Instruments products must ONLY be returned to Roos Instruments for repair or replacement. NO CREDIT WILL BE ISSUED. All freight and insurance charges are non refundable. Any changes to our return policies will be posted to this page.